Your Score-O result is calculated using the sum of the point values for each control you visited (Points), then subtracting 20 points for each minute or fraction of a minute you were late past the 90 minute time limit (Penalty), resulting in value in the Total column. 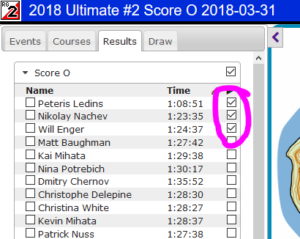 For the Ultimate O categories, the additional Score column is the calculated Ultimate O series score for this event, which is a ratio of your Score-O total versus the best Score-O total in your class. More details on the Ultimate O Series page.